8' Inground Expanded Metal Model Shown. 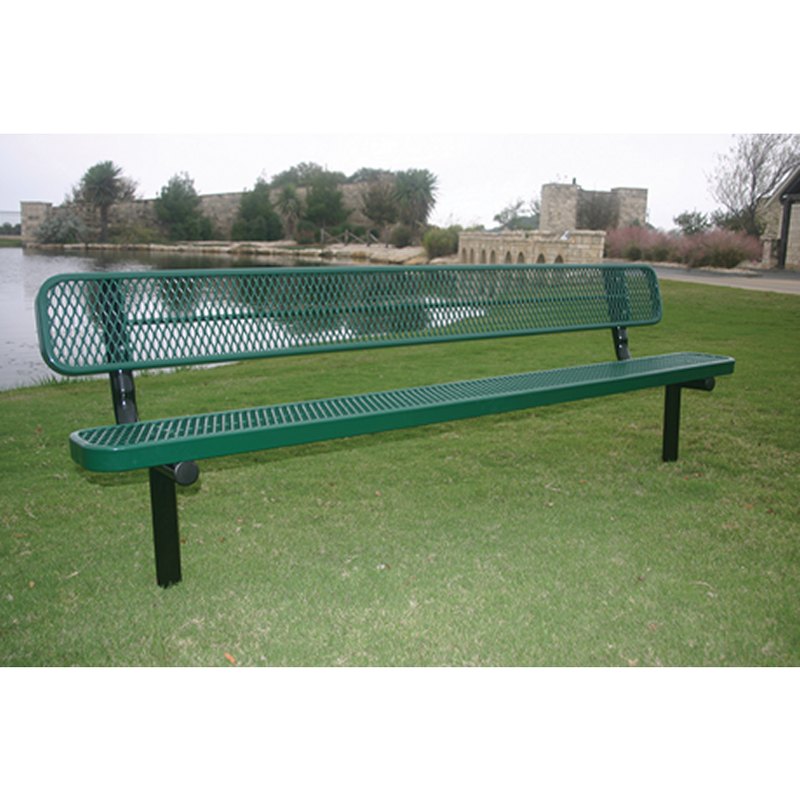 Coated with a Premium Polyethylene Coating that is similar to some of the other brands out there, but much higher quality. ParknPool warrants the original purchaser and not any other purchaser, or subsequent owner, that its Commercial Outdoor Furniture is free from defects in material or workmanship including cracking, peeling, chipping, blistering and corrosion. This Limited Warranty applies only to systems constructed entirely of components manufactured and/or supplied by ParknPool for the applications from the date of purchase for the duration of 5 years under normal use over 5 miles from nearest salt water coast line. The Limited Warranty is excluded for applications at 0 to 5 mile from the nearest salt water coast line. Should your ParknPool furniture not conform to this Limited Warrant, ParknPool will repair or replace the non-conforming component of the system, or refund an amount equal to the replacement component, at the sole desecration of ParknPool which remedy is exclusive. Any concession given on this warranty will be “Pro-Rated” from the time of product delivery. Damage from abnormal or improper use or design, accident, neglect, abuse, abrasion, air pollutants, improper service or installation, or damage caused by 3rd party, flood, fire or act of God is not covered by this limited warranty. Use within five (5) miles of nearest salt water coast line or other harsh environments is excluded from coverage of this limited warranty. This limited warranty does not apply to any nonconformity in portions of components or other system components improperly altered for installation. ParknPool recommends that when installing to use the proper mounting instructions and hardware provided by ParknPool. Altering any manufactured part by ParknPool will void this warranty. YOUR REMEDY UNDER THIS LIMITED WARRANTY WILL NOT INCLUDE LABOR TO REMOVE NONCONFORMING COMPONENTS OR TO INSTALL THE REPLACEMENT COMPONENTS, DELIVERY CHARGES, SALES TAX OR ANY OTHER CHARGES, NOR IS PARKNPOOL REQUIRED TO PROVIDE SUCH LABOR OR SERVICE OR FOR OTHER CONSEQUENTIAL OR INCIDENTAL DAMAGES. THIS LIMITED WARRANTY IS IN LIEU OF ALL OTHER EXPRESS WARRANTIES. PARKNPOOL MAKES NO OTHER EXPRESS WARRANTIES, AND DOES NOT AUTHORIZE ANY OTHER PERSON OR AGENT TO MAKE ANY OTHER EXPRESS WARRANTIES. PARKNPOOL NEITHER ASSUMES NOR AUTHORIZES ANY OTHER LIABILITY OR OBLIGATION IN CONNECTION WITH THIS PRODUCT. EXCEPT TO THE EXTENT PROHIBITED BY APPLICABLE LAW, ANY IMPLIED WARRANTY, INCLUDING WITHOUT LIMITATION, THE IMPLIED WARRANTIES OF MERCHANTABILITY AND FITNESS FOR A PARTICULAR PURPOSE WITH RESPECT TO THIS PRODUCT, IS LIMITED IN DURATION TO THE FIVE (5) YEAR TERM OF THIS LIMITED WARRANTY. IN NO EVENT SHALL PARKNPOOL BE LIABLE FOR ANY CONSEQUENTIAL, SPECIAL, OR INCIDENTAL DAMAGES ARISING OUT OF OR CONNECTED WITH THE PURCHASE OR USE OF THIS PRODUCT OR FOR ANY BREACH OF WARRANTY. SOME STATES DO NOT ALLOW LIMITATIONS ON HOW LONG AN IMPLIED WARRANTY LASTS, OR THE EXCLUSION OR LIMITATION OF INCIDENTAL OR CONSEQUENTIAL DAMAGES, SO THE ABOVE LIMITATIONS OR EXCLUSION MAY NOT APPLY TO YOU. THIS WARRANTY GIVES YOU SPECIFIC LEGAL RIGHTS, AND YOU MAY HAVE OTHER RIGHTS THAT VARY FROM STATE TO STATE. THIS WARRANTY IS APPLICABLE ONLY TO SYSTEMS INSTALLED WITHIN THE CONTINENTAL UNITED STATES AND CANADA.